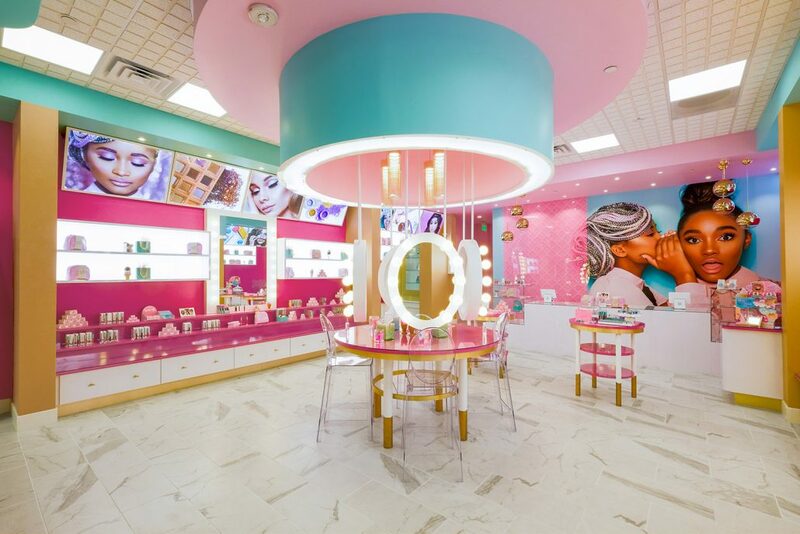 A San Diego store found a way to mix the fascinating worlds of cosmetics and desserts, and we are the ones behind its interior design. 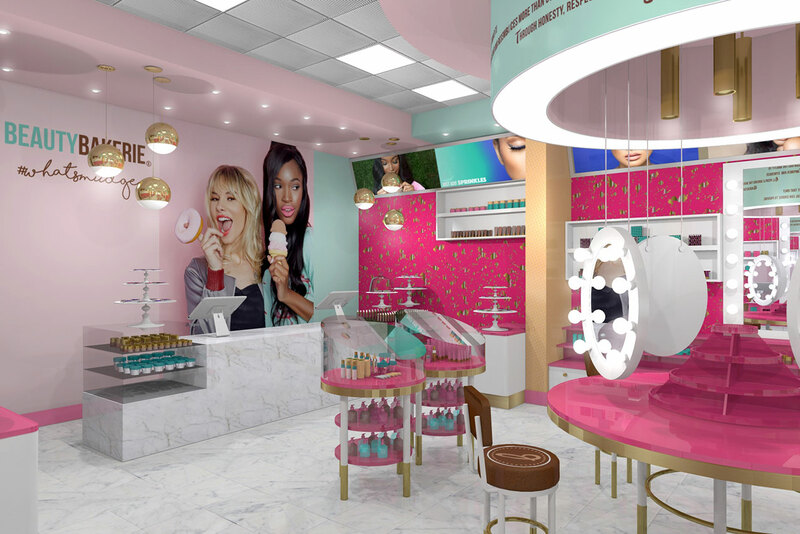 Opening in April this year in Westfield Mission Valley, the Beauty Bakerie cosmetics store has a mouth-watering interior reminiscent of scrumptious dessert bakeries. 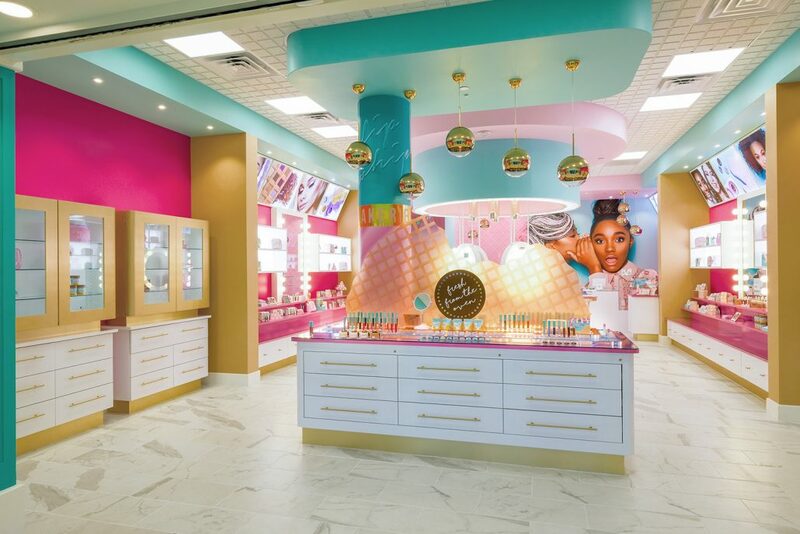 The idea of a “beauty bakery” came to Cashmere Nicole, the owner of the store, when visiting a gourmet cupcake kiosk in a Miami mall. Beyond this initial point of inspiration lies a moving personal story of challenges and success that has all the ingredients of real life. With some extra spice, we should say – since Cashmere Nicole and her brand have even enjoyed the interest of Beyoncé, herself impressed with its story. 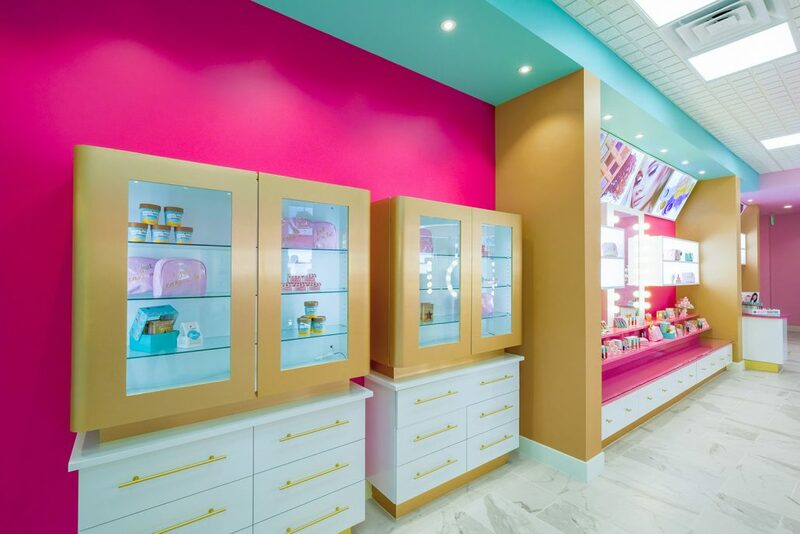 With the intriguing concept of “beauty meets gourmet dessert” in mind, we created a space where products are displayed as in a dessert store, with the same final effect of leaving the customers wishing for more. 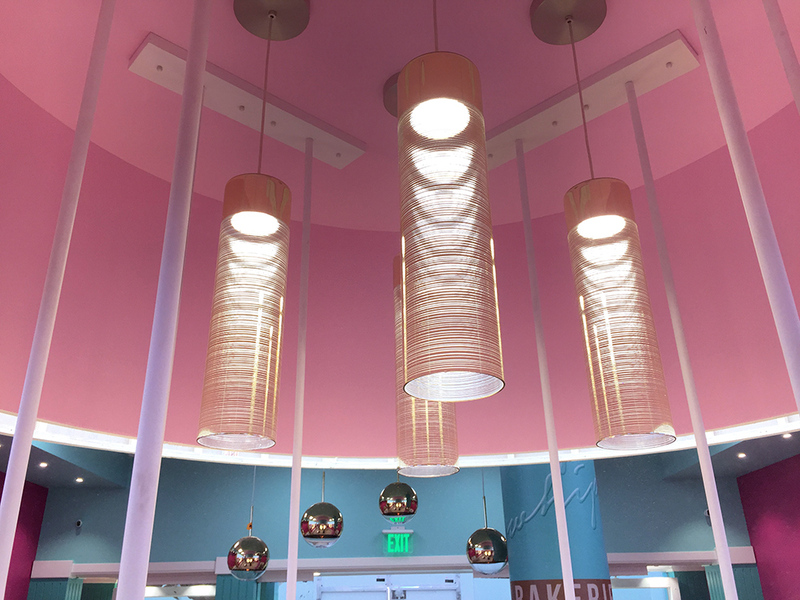 We used a young and vibrant palette of pink, tan and turquoise, then allowed this mix to stretch from pastel to bright tones, creating a place that looks cheerful and playful, yet not overwhelming. We wanted the interior to look fresh and trendy, and appeal to the young clientele. 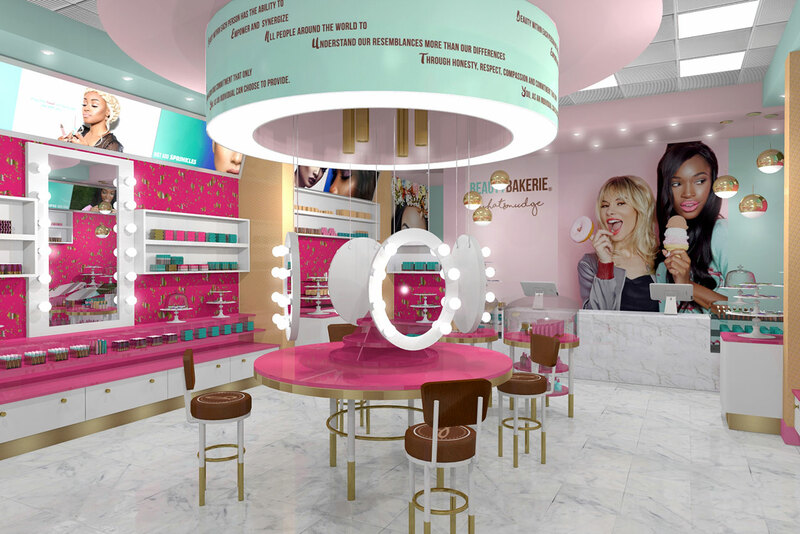 This is a place where every corner introduces a new decorative element, a task that we achieved by mixing patterns and solid colors, large images and written messages, then contrasting all these with brass accents. We used white shelving and neutral tones for floors and counters as a way to cleanse the palate in the middle of this chromatic abundance and give these colors even more depth by contrast. The metallic details and accents achieved the same thing, adding reflections of light and gold tones to the decorative mix. Making its glorious return to the world of interior design, brass is definitely here to stay, so we used Kohler’s Purist cabinet knobs as both functional and decorative accents, as well as elegant brushed brass bar knobs that emphasize the long, modern lines of the drawers and the cabinets. 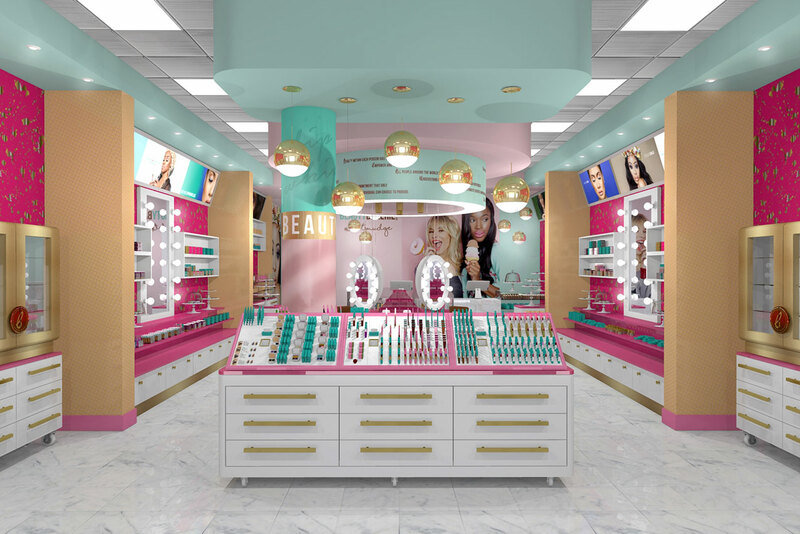 Light was very important in designing this interior – after all, great lighting is a much used beauty secret. 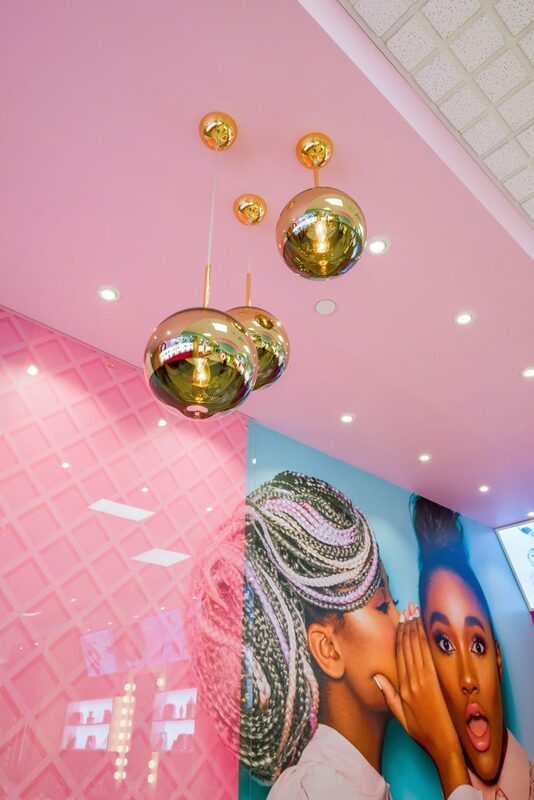 We complemented the central circular structure with a bouquet of svelte Turia brass pendant lamps from Hamilton Conte Paris, and we chose Tom Dixon’s Mirror Ball 25 to create a landscape of uneven globes of light all across the store. These balanced the angles of the space and softened its look. 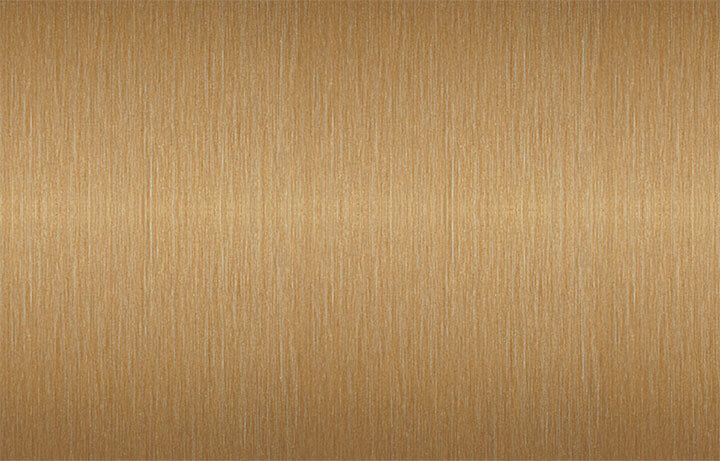 We used the DecoMetal brushed bronze-tone aluminum, with the same brass-like reflections of color, to finish the look of the counters. 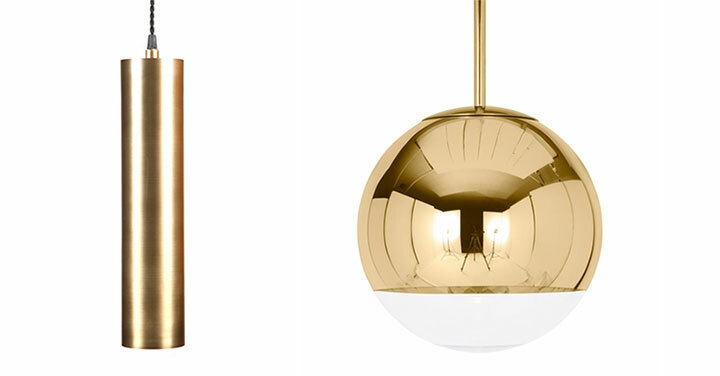 Around make-up tables bathed in vanity-style lighting, high chairs reiterate the brass motif. 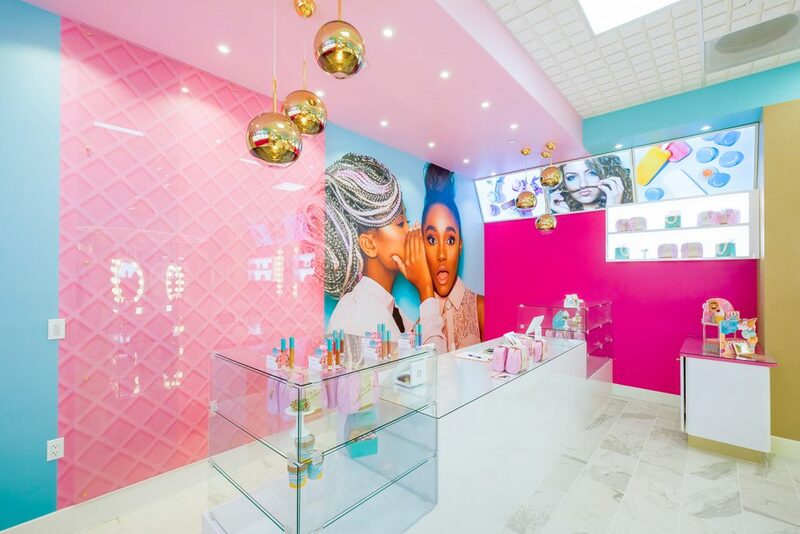 Bold and fresh, Beauty Bakerie beauty store interior is an example of excellent branding behind which lies clarity of vision – and passionate design. 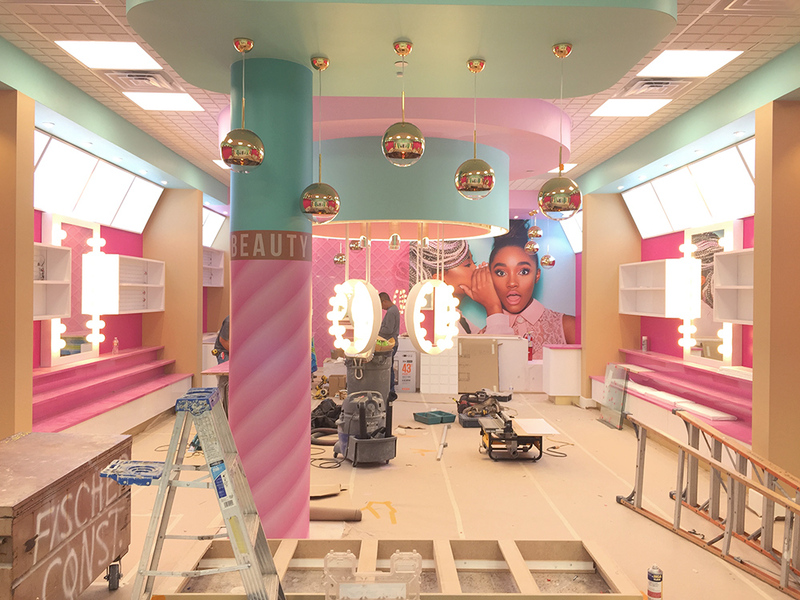 Beauty Bakerie store construction. 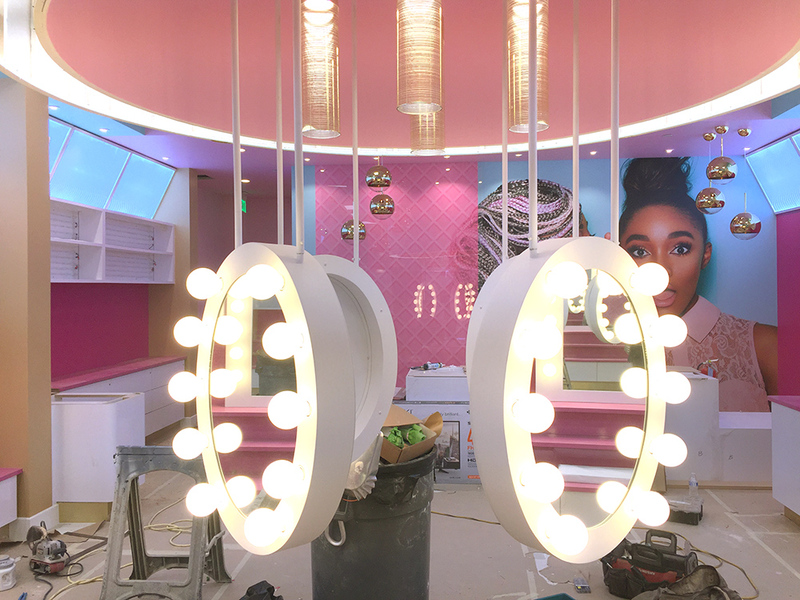 Custom mirrors and lighting by Tazz Lighting.